A reviewer’s job is not always a happy one, having to meet dead­lines and writing a balanced and unbiased review without un­leashing a storm of protest from either the manufacturer or average modeller. However, now and then, along comes a kit that, despite its faults, is a joy to make and behold, which makes it all seem worthwhile. 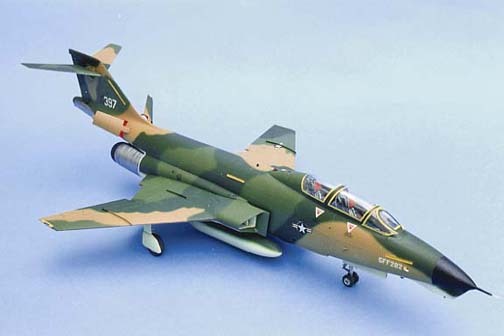 One such kit for me is Monogram’s 1:48 scale F-1O1 Voodoo. 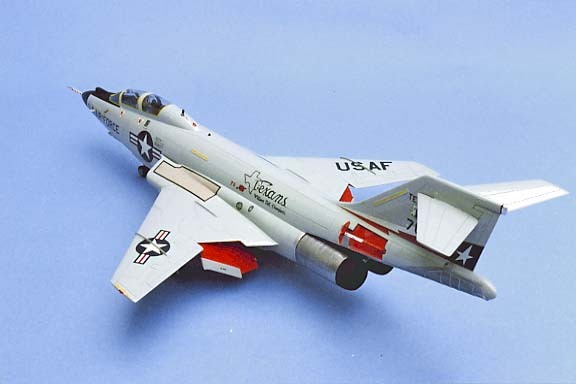 The first kit to be released was the interceptor version of the voodoo, the F­1O1B. This is a two-seater with long exhaust cans and a rotary weapons bay equipped with Falcon or Genie missiles. 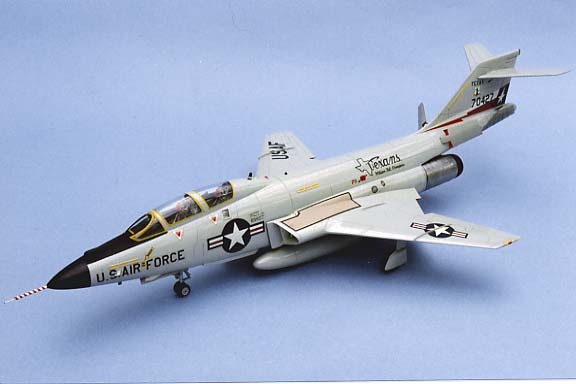 This model is moulded in light grey plastic and has markings for a USAF aircraft “The Texans” and a Canadian machine which was the only other air force to use them. The second kit release was for the RF 1O1B, again a two-seater but with a camera nose section. This comes moulded in olive green plastic and a very small decal sheet covering the only unit to operate this mark. On both kits, the panel lines and detailing are depicted with raised lines which I thought just a, little on the heavy side, so I rubbed the whole lot off my original kit and rescribed the lines using an Olfa P Cutter But, after seeing the other model painted and finished, I am not sure if I have made any improvement! The cockpit areas are quite superb with raised instrument details that are so easy to paint and dry-bush with a little white or silver to make the details stand out. Of course, the cockpits are different on the real aircraft and Monogram has given different panels in each case which look convincing to me. Even the front coaming is of a different design, with the interceptor version incorporating the movable gun sight and the backseater’s hood for the radar tube which can also be mounted in the stowed position as shown. The small windscreen for the rear seat should have its framework painted grey, although this is not indicated. It’s so nice to see smaller items, such as throttle and radar operator’s hand control included with the control column, and other tiny details like the canopy mounted rear-view mirrors on the clear frame. The seats in the F-1O1 are quite distinctive and Monogram’s offerings have captured the feel of these very well indeed. In fact, I think you would be hard pushed to find a better seat anywhere, the straps and pipes are all there and the painting instructions are very comprehensive. The small triangular portion on the lower wing (part 33) to the rear of the flap and its corresponding part on the top wing half need their mating surfaces sanded smooth or you won’t get a good trailing edge join. The front under carriage leg is supposed to be assembled with the well, but this makes other work and painting difficult later on. I found it was possible to fit the leg afterwards with a little filing, pushing and pulling. There is no positive location for the main undercarriage legs. It’s a matter of aligning all the struts and cementing in position using the gear doors as extra support. I felt that this was a bad point and one where a novice could come unstuck. You will need to add some weight in the nose of this model as it is quite tail-heavy. I used the tiny lead pellets that come in shotgun cartridges mixed with epoxy resin. Just pour some in the nose, but in the RF-lOl, make sure it’s in the top of the nose and can’t be seen through the camera windows! When you join the wing to the fuselage, use a wide strip of tape from wing tip to wing tip, over the fuselage to make the join good. At this time, I also filed a step in the underside of the fuselage at the back end to match the stop on the very rear end of part 33 wing bottom, to get a better join. All the air scoops had dimples in them and needed filler, but drill a little deeper to give a better purchase or, how about drilling out the mouths to give a hollow effect? The fuselage strakes aren’t the best of fits, although the RF set is better, I cured the problem with some white PVA glue run into the join and levelled off with a wet finger. The exhaust shrouds are not quite the same diameter as the after-burner rings and to sand them level would destroy the fine details. You can solve the problem by making the outer edge on each shroud a good join, leaving the inner edge a little proud; this can be lightly cleaned up without showing too much. By the way, don’t clean up the joins along the shrouds, as there is a panel line present on the full-size aircraft. While in this area, why not try adding the small deflector plates to the inner edge of the burner rings. These deflect heat from the aft fuselage and are fitted at the 11 and 1 o'clock positions. One other small point, the formation light strips are very heavily done and the decals won’t seat in them properly. I found it better to remove them and replace with 10 thou. card strips. In any case, Canadian CF-lO1s don’t carry them at all! The exhausts and lower rear fuselage are the ideal place to try out Rub ‘n Buff to good effect. Undercoat all the red areas with white or the red will look too dark. The interior of the wheel bays is a lightish green close to F.S.34258, Humbrol HU17. If you paint the nose cone in 85 Satin Black and the anti-glare panel in 33 Matt Black you can achieve a nice contrast. Use a little drop of gloss varnish on the infrared sensor ball. I found it a little difficult to paint the walkway areas, so I painted some clear decal and cut it to fit the area instead. For the F and CF-l0l the overall colour is F.S.16473 ADC Grey available from xtracolor. which gives a nice gloss finish. For the RF-l01, SE Asia camouflage is called for, and for this is I used a sample set of Gunze Sangyo acrylic paints. I must say how impressed I was with them, not only do they spray quite fine, but the finish was as soft and smooth as velvet. They dried in minutes and only had to be lightly thinned with Tamiya thinners. But above all, at the end, I only had to spray a drop of water through my airbrush to clean it out. The paint jars were simply held under a tap and then shaken dry. As is my usual practice, I coated the camouflage with Johnson's Klear before decalling and again after . This helps to hide decal film and gives an even finish all over which is pleasing to my eye. The end of the fairing atop the fin is a clear portion, and if you haven’t already replaced it with a piece of clear sprue you can paint it silver with a black framing to set if off. The canopy frames are well defined and both aircraft will benefit from careful outlining with a paleish yellow; use the same colour to paint the light tapes on the wing tips. Duralumin is a nice colour to use for the undercarriage legs with a drop of 11 Silver for the oleos. Just a few drops of colour for lights, aerials etc, and there you have it. Whilst not 100 percent perfect, an excellent model can be made from it. I thoroughly enjoyed it, and what is more, it’s not too expensive for a US 1 /48th scale kit. Replica In Scale Vol.2 No.1. Since I first reviewed Monogram’s F-101B Voodoo , I have been meaning to make a few more versions utilizing some of the decals that were available. Since then, DB Productions (now under Airwaves) made some conversion kits to convert this particular aircraft into all its different variants. 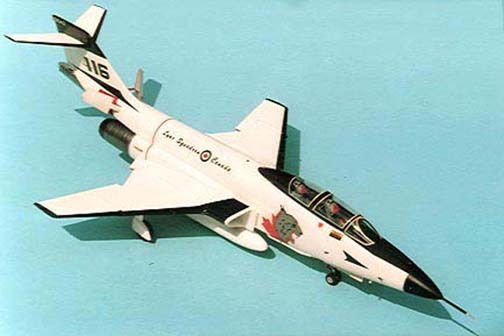 Monogram’s reissue of the F-1O1B as a Canadian Air Force special with its black and white scheme was the one I needed to utilize the conversion sets, so several were purchased. 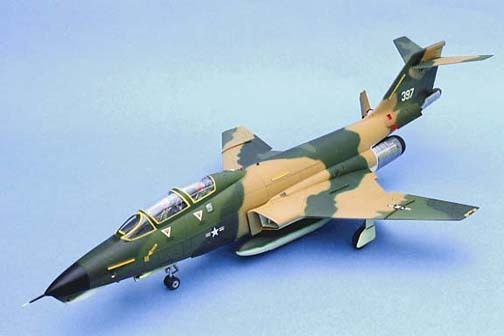 The DB sets were originally meant for the RF-1O1B kit which has several different parts in, but they will work on this kit as DB are making some extra parts to compensate. Firstly, I have built the kit straight from the box, but as a Canadian machine there are several changes to be made. All the formation lights have to be removed from the fin and fuse large as Canadian machines don’t carry them at all (these are much too heavy in appearance anyway). Neither do they use the tape lights on the wing tips, so sand these off as well to achieve a smooth tip. The kit instructions tell you to add Air Scoop, part 67to the location by the forward wheel bay, but a lot of Canadian aircraft don’t have this scoop. However, they do have an internal intake for the refrigeration unit just here, which can be made from sheet plastic with the slot cut out and then fitted flush into the location — check your particular ma chine! Make all these changes before any assembly begins. You will still need to sand the small triangular portion of the lower wing to the rear of the flap to attain a smooth mating surface with the top wing to get a good trailing edge. When you make up the fuselage add the armament bay with care, as the location is a little slack. Check the rotation of the weapons pallet, Parts 16 and 17, if it’s tight, slide the bay along a millimetre or so until the rotation is free and easy. You will need to add quite bit of weight in the nose cone and I use shotgun pellets held in place with epoxy resin. Slide the nose wheel bay into position and cement the nose cone on, checking the fit before finally cementing the wheel bay in. I recommend this route because there is no way to get the right diameter on the fuselage before adding the nose section. This holds true for all the F-101 conversions and will save any cleaning up later. As the plastic is already white, you will only need a fairly thin mix of gloss white sprayed over the model. Leave for a couple of days to harden before masking for the black areas. Use masking tape along the edges, but you can use kitchen towel to cover the remainder. I have used Rub ‘n Buff for the exhaust areas with a little Zebrite grate polish for effect. One other small point, if you wish to add missiles then the two Genie rockets are acceptable, but the Canadians use the AIM-4D Falcons, not the ones supplied in the box. 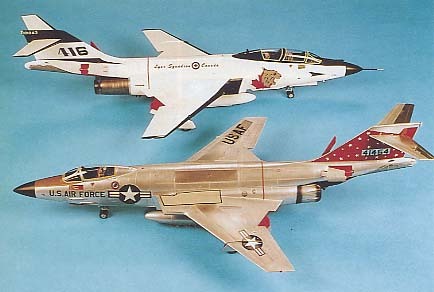 These are in Monogram’s new F-102 kit or available in the Hasegawa missile weapons set C to 1:48 scale. The decals provided are quite correct for the Canadian machine, but no USAF markings were in my three kits, even though they are mentioned and shown on the instruction sheet! The decal plan shows where to place each item, but ignore the reference letters as these bear no resemblance to those on the decal sheet. Photos I have show that no walkway outlines are used on the “Lynx”, so I left mine off. Also, the red turbine warning stripe needs a mention; the one long piece goes on the underside, though you will need to use a fresh piece for the top surface as the three remaining bits will not reach all the way round! I have utilised a strip cut from the Xtradecal parallel lines sheet. F-lOlA/C Conversion set DB56. I think these are now under the Airwaves Banner and worth searching out. The price may seem a little high, but when you see the excellent quality of the resin parts and the nice vac formed canopies, I think you will agree that they are worth it. All the parts, metal and resin, come ready to use and the canopy only requires careful trimming out, so it’s not much more difficult than making up the original kit. 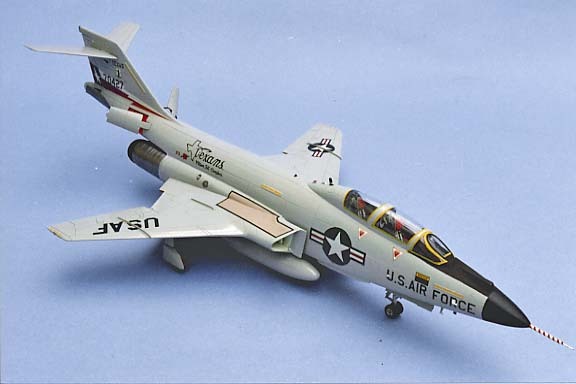 It is with this conversion set where it makes a difference between using the new release of the kit or the older RF-101B. The problem lies with the missile pallet in the new kit which will need a fair amount of filler to make the smooth lower contour whilst the older kit has the flush surfaces provided. There is no problem with the other sets because a camera bay is provided to cover the missile bay. The instruction sheets are of the barest minimum, but they cover everything and include full scale drawings of the areas to be cut off the kit parts, most helpful! My first job was to cut away the exhaust area on the fuselage halves. I used a steel rule and scalpel to score deep into the plastic along the horizontal line and a razor saw for the vertical cuts. Just take away the lower edge of the air brake bay and you will be correct. Once most of the plastic is removed tape the fuselage halves together and use a sanding block to ensure both sides are level and check-fit the replacement “keel”. You may just have to ream out the plastic at the rear join to get a smooth joint. While the halves are taped-up use a rule and scalpel to cut around the panel line of the cockpit area for the replacement spine. Cut just on the inside edge of the line then use the sanding block to get a good fit for the new part. Note the sloping edge of the resin part and shape the plastic to suit and you should find it will just drop in and be flush. Before you cut the kit cockpit bath, place it in the fuselage and note carefully where it should finally rest, as after removing the rear area, shown on the sheet, it floats around a little. Cement the fuselage halves and whilst they harden, turn your attention to the wing bottom, part 33. Sand off the bulge aft of the wheel bays so it’s flat to match the new metal gear doors. The less powerful engines of the earlier lO1s did not have those large air scoops on the lower fuselage, so prominent on the two-seaters, but there were flush intakes and I made these from 20 thou card. Draw around the bottom edge of part 65 to get the shape, and then cut the ‘V’ shape vent in each piece, cement one in each location and sand smooth. Before you cement the wing tops to the bottom, sand the trailing edge triangle for a really good fit. Remove the location for the data link aerials, part 96, and the tape lights from the wing tips. Now that the fuselage is hard you can fit the resin keel and fuselage spine. Note that the new keel forms the bottom edge of the air brake bay. Use epoxy resin to fit these parts as this will also act as a filler if your cut hasn’t been quite accurate. Do not fit the air scoop, part 67, as there is a flush intake here, so make one similar to the rear pair made earlier and sand flush as before. Add the nose wheel bay, but don’t cement it yet, you will have to trim the forward edge just a little to get a flush surface for the nose section to fit properly. Again use epoxy to fit the new nose, checking the fuselage matches the resin part all the way around. Cement the wheel bay, cockpit and weapons bay, part 66, you will not need any weight, as the resin nose is heavy enough to balance the model. Now you can add the armament door and fences, parts 70 and 71. Leave overnight to harden, as quite a bit of filler will be needed here. Sand down the fences and other protrusions until you have a nice smooth area on the underside with the missile troughs all filled in. Add the side spotlight cover, part 86, and fill the edges before sanding flush. Remove the moulded formation lights from the fin and fuselage then generally clean up all your joins with very fine wet and dry paper, preferably 1200 grade, as this will be a silver aircraft and every little scratch will show. At this stage I found it easiest to engrave the new panel lines using an Olfa P-Cutter and a six-inch flexi-steel rule for horizontal lines. The vertical lines which go around the fuselage are best done using a strip of 15 thou clear plastic card approximately 10mm x 120mm, you can see where you are and it bends more readily. Put a couple of blobs of Blu-Tack on your workbench to hold the model still and put two tiny beads of it behind your steel rule so it does not slip as you are scribing. The positions of the lines are given on the instruction sheets and you will find the Tritool templates quite useful here to make those panel catches etc. Add the made-up wing section paying particular attention to the lower fuselage/weapons bay join and the rear section around the engine exhaust, making sure that they are not distorted or that the new resin burner cans won’t fit. There is quite a gap along the top edge of the wings, but you can overcome this with a bit of tape from wing tip to wing tip over the fuselage until the cement dries. If you still have a slight gap, you can use a drop of Zap a Gap or, as I do quite frequently, a drop of PVA white glue run in with a wet finger tip. For this and other single-seat Voodoos you have to thin down the wheels by 1mm. I found the easiest method was to lay a bit of 20 thou card on the bench with a knife blade resting on top, the point just protruding over the edge by 1mm, rotate the wheel halves, parts 41, at the edge of the card and the point will scribe a neat line which you can then sand back to before reshaping the edge of your tyre. Exercise extreme care though, as you could easily cut your fingertips! The main gear doors, parts 40, need attention now. The bulged bottom section has to be removed, but don’t just slice through at the join, sand back carefully and save the little “tab”. This will give you something to mount the new white metal “door” onto. From the scale drawings I have, it seems the arrestor hook is just a little longer on the single-seaters, but I felt this was not enough to worry about. However, the hook is certainly a lot flatter than the kit item. Hold the part over a heater to make it malleable and gradually flatten out the arc by careful bending. Drill a new mounting hole approximately 1/8th in. forward of the original at an angle and you will find it locks the hook down in the right position. Remove the small aerial from the top of the fuselage and the one behind the nose wheel bay. Make the large pitot fairing from 20 thou card and fine rod, but make sure you mount it clear of the undercarriage doors. Add the gun troughs now and two A.O.A. (angle of attack) transducers just forward of the hinged panels on the new nose. I did permit myself one improvement on the resin parts and that was to drill out the centre of the exhausts with a 3/8th drill, this is only a tiny bit smaller than the centre petals, so take care not to damage them as you go in. Don’t go right through though; just give the impression of more depth inside. The cockpit is one area where most people want to do their own thing, but I elected to just make a new rear wall to fill the gaps from 15 thou. card (approximately 14 x 6mm is the size). Trim out your canopy with a pointed pair of sharp scissors, make the first cut approximately 1/8th in. from the line to separate from the sheet, and then trim carefully until it fits. Hold the canopy over a sheet of white paper with the light reflecting through to show up the cut line as it is quite fine. On most single-seaters and the rear position on US two-seat aircraft, there is a (tape antenna) VHF aerial set into the canopy which shows up quite clearly in some photos. I have simulated this by lightly scoring the inside of the canopy with a “not so new” scalpel blade. Firstly, draw out the pattern on some one inch masking tape, then carefully place on top of the canopy and use the outline “shadow” to score the lines from the inside, but take care and do it slowly. You’ll be pleased with the effect which can also be used to simulate the detonation cords in Harriers and Hawks etc. If you want to depict the canopy open, you will need to make some interior framing to fit the metal interior to. If you want it shut though, super-glue the metal to the decking and use white PVA glue to hold the canopy down. There are several silver finishes on the market now and I think that the Alclad II system is probably best. As I still use Rub’n Buff quite a lot, I thought I would try a method I had been told of — that is to spray the Rub’n-Buff on. I just squeezed some into the jar and added thinners. It took quite a bit of stirring, but when it was sprayed on, the effect was very good and extremely even, providing a good base to start from. I used some Post-it sheets to mask off some panels to buff to varying degrees, others I rubbed over with Zebrite for a real metal finish. One I added some matt varnish to and yet another I painted with Polished Aluminium. Don’t worry if you make a finger mark here and there, as a little extra buffing will remove it. When I was satisfied with my efforts I sprayed the complete model with Johnson’s Klear, starting off with a couple of very fine coats and then adding a good coat to seal all the silver in. This process seems to add a real metallic look to the model. You can now paint the anti-glare panel and nose cone without the paint lifting the silver below. I have used decals from the old Almark range, which were available from ED. Models. There are two sheets for Voodoos, A48-21 and 22 which pro vide the non-standard items and specialist markings for each aircraft of which there are some 14 examples. 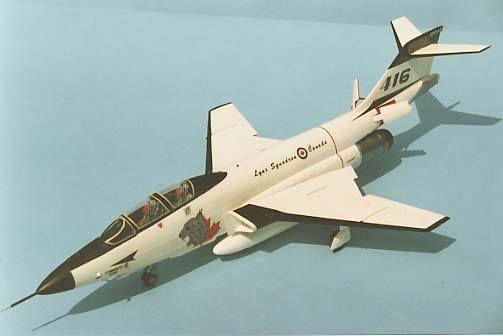 The new kit only has markings for the Canadian machine, so you will have to find your own stars and bars as well as the U.S. Air force decals, all are available from Super Scale decals or Scale Master. On silver aircraft the fuselage stars should be 4Oin. while those on the wings are 35in., ‘U.S.A.F.’ on the wing is in 25in. letters and the ‘U.S. Air Force’ on the fuselage is in i2in. letters. I have chosen the aircraft that was flown by 1st Lt. Nielsen from Bergstrom AFB Texas to Liege in Belgium in 1958 to prove the transatlantic route using KC-135 tankers to refuel en route. Nielsen’s aircraft looks quite good with its red fin that has white stars dotted about. Recommended! Ko Ku Fan No.59. F.A.O.T.... World. Modern Military Aircraft, Voodoo, by Lou Drendle. Squadron Signal Pub. Fighting Colours, Century Series by Lou Drendle. Squadron Signal Pub... Fighting Colours, USAF Europe ‘48-’65 by Rob Robinson. Squadron Signal Pub.... 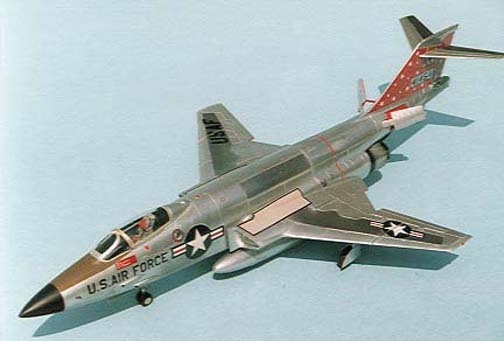 Detail and Scale F-101 Voodoo Vol.21 by Bert Kinsey. Detail & Scale Pub.... 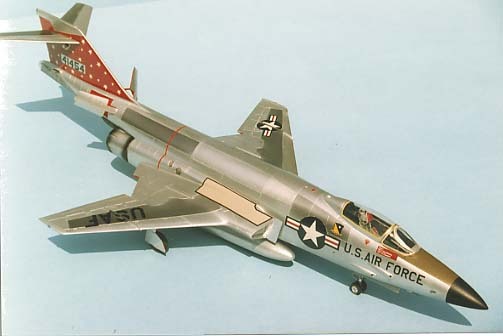 Replica in Scale Vol.2 No.1 magazine..... Aerofax, Minigraph 5, F-101B/F Voodoo by Kevin Keaveney. Aerofax Pub..... Canadian Profile CF- 101 Voodoo No.2 by Rob McIntyre. SMS Pub.